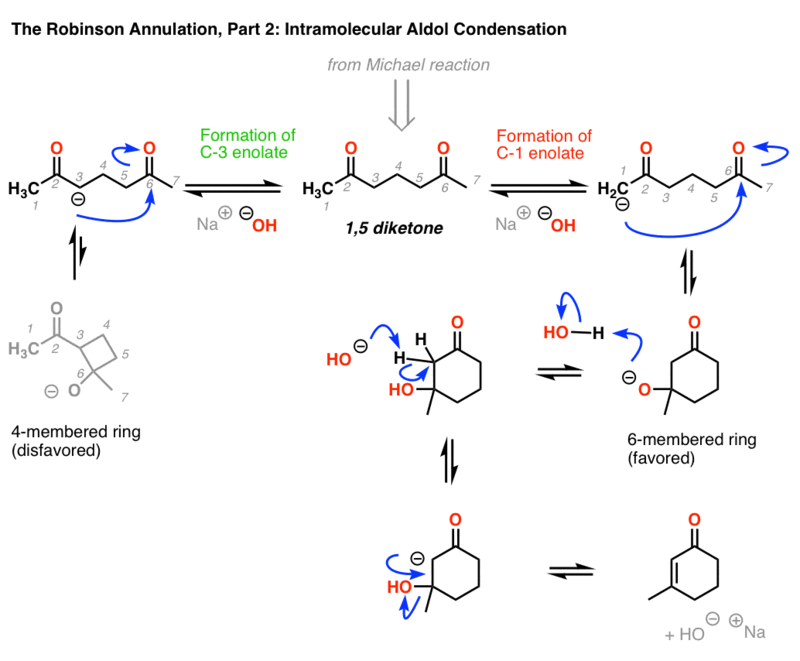 We get to the Robinson Annulation (and its mechanism!) near the middle of the post. 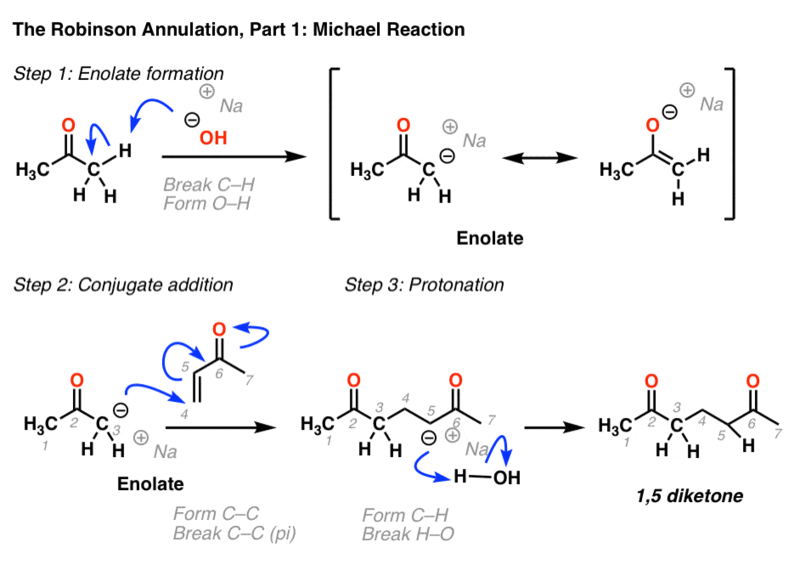 First, we’ll first (quickly) revisit intramolecular reactions, the Aldol Condensation, and the Michael reaction. There’s something about intramolecular reactions that often trips students up. Conceptually, understanding an intramolecular reaction is not much different than understanding what happens when you fasten a belt, making a loop in the process. However…. 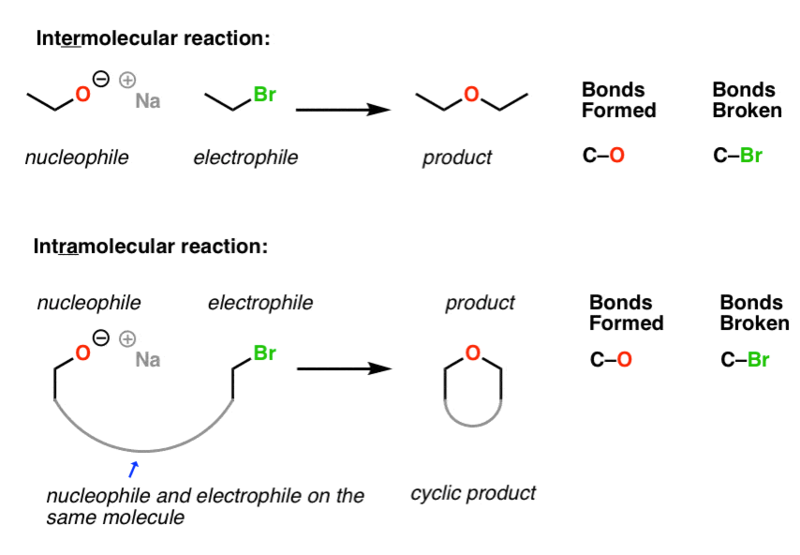 I’ve seen students go into an exam thinking they know a reaction cold – but when suddenly confronted with an example of a nucleophile and an electrophile together on the same molecule, they freeze. This is despite the fact that exactly the same bonds form and break! It’s OK. Organic chemistry can seem very abstract at first. It can take time to appreciate that all these symbols we draw for molecules are proxies for three-dimensional objects, and follow many of their familiar principles! Today it’s the aldol condensation‘s turn for the intramolecular treatment, which is part of a larger process called the Robinson Annulation. Q. What’s the aldol condensation again? The base-catalyzed version of the Aldol Condensation begins with formation of a nucleophilic enolate through deprotonation of the “alpha-carbon” of an aldehyde or ketone, and the subsequent addition of this nucleophile to the electrophilic carbonyl carbon of a second aldehyde or ketone, forming a new C-C bond. 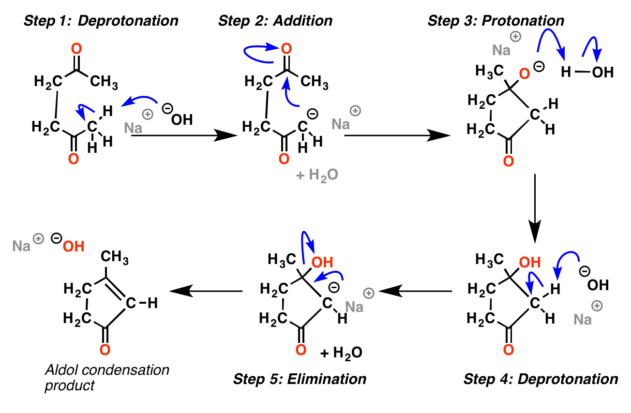 Upon heating, the resulting aldol addition product is deprotonated to give a new enolate, which then displaces the hydroxide ion, resulting in a carbon-carbon double bond accompanied by the net loss of water (H2O). [note E1cb] The resulting product containing an alpha, beta unsaturated ketone (or aldehyde) is the aldol condensation product. This picture shows the result of aldol condensation between two molecules of 2-propanone (aka “acetone”). So what would an intramolecular aldol reaction look like? Drastically different? No, not drastically different. Actually, all we need to do is replace two of the C–H bonds with a C–C bond that links the two ketones. That’s it! Now our nucleophile happens to be on the same molecule as our electrophile. So, just like fastening a belt, when the two combine, we obtain a “loop”, or ring. The mechanism is exactly the same. Upon treatment with base (e.g. NaOH) an enolate still forms, and it still adds to a ketone. And after the net loss of H2O, the exact same sequence of bonds has formed and broken. The only difference is that since the two ketones are linked, we now we have a ring! The best candidates for ring closure tend to be five and six-membered rings, which combine low ring strain with a reasonable reaction rate. Seven- and higher-membered rings tend to be slower to form, due to a lower “effective concentration” of the nucleophile in the vicinity of the electrophile. An example for the formation of a six-membered ring through the intramolecular reaction of a “1,5-diketone” is shown below. [Note: the 1 and 5 here don’t refer to the IUPAC numbering, but to the fact that the second ketone is 4 carbons over from the first one]. The pattern of bonds that form and break is exactly the same as above. We’ve actually already seen a reaction that makes 1,5-diketones: the Michael reaction. Now let’s join these two threads together. Pattern recognition is a key skill in organic chemistry! then what would happen if we were to stir together a ketone, an alpha,beta-unsaturated ketone, NaOH, and then heat the mixture? Would we end up with an intramolecular aldol condensation product? 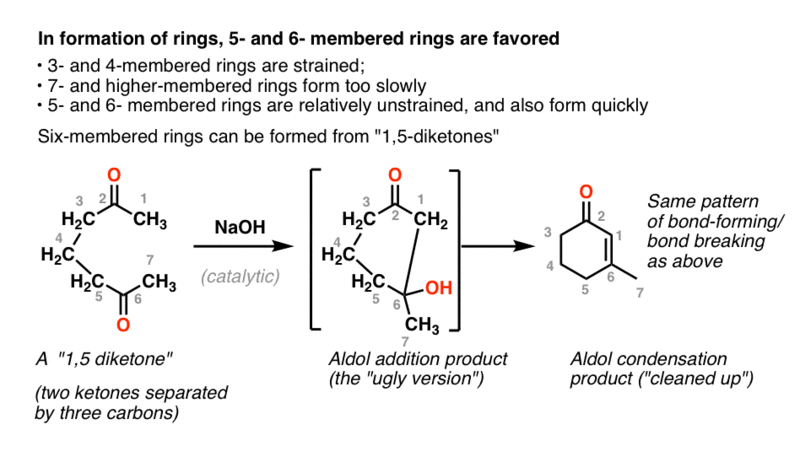 The process begins with a Michael reaction and ends with an intramolecular aldol condensation to give the new ring. It is a classic example of a tandem (or cascade) reaction, where an initial reaction provides the starting material for a successive reaction. Let’s walk through the whole mechanism, using the simplified example of 2-propanone and methyl vinyl ketone. 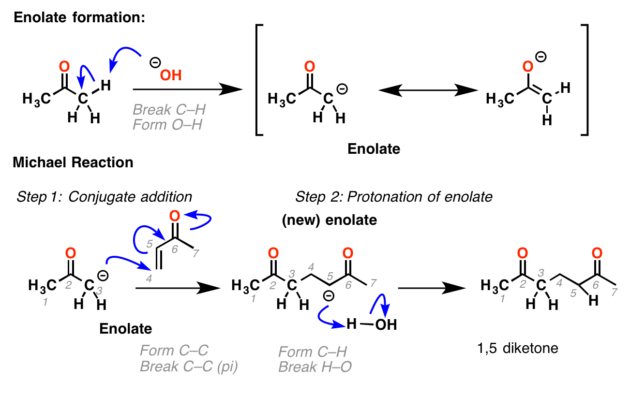 protonation of the new enolate. The 1,5-diketone produced by the Michael reaction then becomes the starting material for the next segment of the Robinson annulation, the intramolecular aldol condensation. Formation of the enolate on C-1 is followed by attack at the ketone five carbons away, giving the six-membered ring. Protonation of the negatively charged oxygen, followed by deprotonation at the adjacent carbon, gives a new enolate. 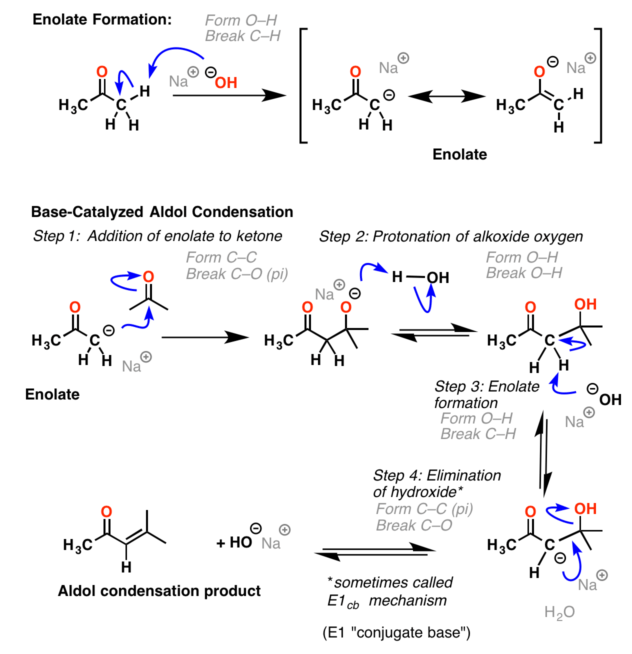 This enolate then expels a hydroxide ion (HO- ) from the adjacent carbon, forming a new carbon-carbon double bond, resulting in the aldol condensation product. It’s extremely important to be able to look at the structure of a product of the Robinson annulation and work backwards to the two components. The first step is to recognize the key pattern in the product of a Robinson: a six-membered ring containing a double bond adjacent to a ketone (an alpha, beta unsaturated ketone). Next, work backwards from the Aldol condensation: so in the reverse direction, break the C=C bond and place two C-H bonds on one end (the alpha carbon of the ketone) and a C=O bond on the other end. Finally, work backwards on the Michael: break the C-C bond, and replace with a C-C pi bond on one component and a C-H bond on the other. That’s probably enough about the Robinson. But for the keen, I present two applications of this reaction in synthesis, particularly applied to steroids. You may have noticed that six-membered rings make quite a few appearances in organic chemistry. So the Robinson annulation has found its share of useful applications. One prominent example is found in the industrial synthesis of the steroid hormone estrone, a precursor of the active component in birth-control drugs. What makes this a particularly high-yielding example is that the pKa of the diketone is about 11, ensuring that it will be deprotonated selectively over the all the other possible alpha-carbons (pKa ~16) helping to ensure that the Michael reaction is relatively high yielding. Furthermore, the methyl group at that position ensures that it can’t be deprotonated again in the intramolecular aldol condensation step. One of the keys here was to employ a Dean-Stark trap that sequesters the water that is formed as a result of the reaction, driving the reaction toward completion. Fun fact. This intramolecular amine-catalyzed aldol condensation was actually a key sharpening stone in the development of one of the most important areas of modern chemical research. In 1971, Zoltan Hajos and David Parrish had the bright idea of using (chiral) L-proline instead of pyrrolidine [the cumbersomely named Hajos–Parrish–Eder–Sauer–Wiechert reaction] which resulted in an optically active product. This result sat more or less dormant in the chemical literature for about three decades, until this 2000 paper from Barbas, List and Lerner opened the floodgates on the development of organocatalysis. Even within the past few years, new variations of the Robinson Annulation have been developed. An enantioselective example from the Toste lab is highlighted here. Another key factor is that cyclobutene has even more ring strain (about 4 kcal/mol) than cyclobutane. Therefore, formation of the 4-membered aldol condensation product is even more unlikely. An Exercise In Mind Reading? Can I get the answers？ Thanks! Glad you found it useful Jennifer!